Wireless TV headphones are a great invention of technology. You can watch as much TV as you want without any worries of high volumes or tangling cables on the floor. If you already own one of these, you’d know what you had been missing all this time. And if you are thinking along the lines to get one, then we are here to help you with your selection. Check out our list for the best wireless headphones for TV that we have piled up after lots of research. What are Wireless TV Headphones? How to Connect the Headphones with TV? If you want the absolute best wireless headphones for enjoying your TV time, you have to try Sennheiser﻿ RS120 On-Ear Wireless RF Headphones. Not only are they very reasonably priced, they also provide an excellent performance with a superb sound quality and a long battery life. The Sony MDRRF985RK wireless RF headphones are perfect for you if you are looking for something that can run up to many hours on a limited budget. With a battery life of almost 25 hours, you can enjoy nonstop TV without worrying about recharging them. If you are a true audio lover and want something that can be used for more than just TV then you have to try the Avantree Wireless Bluetooth Over-Ear Headphones. These dual mode headphones with a whopping 40 hours battery life and hi-fi sound system will give you an audio experience of your life. RIF6 ﻿Wireless﻿ Headphones for TV is another inexpensive option for the budget conscious people. If you want an all in one pair of headphones to be used for your gaming, music, radio, and every other sound related stuff, then you must try out the RIF6. 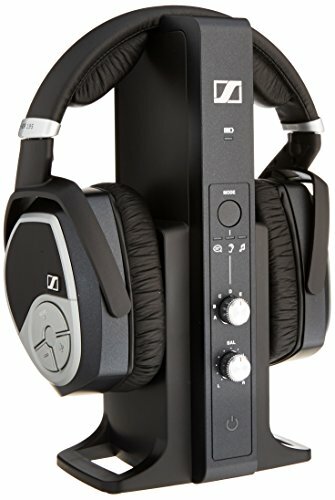 For those of you, who want to have a pair of highly advanced and modern day headphones, the Sennheiser RS 195﻿ ﻿RF﻿ Wireless Headphone System is going to do the job. The headphones deliver a huge and strong signal range of 325 feet with an unbeatable sound quality. Let’s begin our list with the one that is not just the best but is also within the reach of the majority of the people because of its reasonable price. So here you go with the “Sennheiser RS120”, a completely pocket-friendly option from the renowned brand with an utmost excellent performance. These highly comfortable headphones are going to add too much convenience and fun to your TV watching experience without disturbing others. The headphones boast a very strong wireless connection that lets you enjoy a clear and disturbance free sound. The headphones feature an open-air design that results in delivering you very accurate audio details. The 300 feet interference-free reception of the headphones easily makes its way to you through walls and ceilings without any problem. One of the major likable things about these headphones is their lightweight design. You don’t feel even a slightest of pressure or weight on your ears due to their presence. In addition, the headband of the headphones comes padded to provide you anoptimum level of comfort while enjoying your TV. You can put them on for hours and hours without feeling any shred of uneasiness or discomfort. For getting the clear reception, the headphones feature 3 RF channels. The volume and power switch are also there on the headphones that let you easily control them. And the overall set up of the device is also quite a cakewalk. Generally, in wireless devices charging is almost always such a big nuisance. But, it is not the case when it comes to RS120. The wall-mountable transmitter of the headphones works as a charging unit. And the headphones are recharged while being kept on the metal cradle. Unlike many others that you have to recharge over and over again, you can enjoy up to 20 hours of non-stop usage with RS120 because of its high performing and long lasting batteries. The headphones come with a 2 years warranty, making your purchase a great deal. The Sony MDRRF985RK is yet another great option for people who do not want to go overboard with their budget but are looking for a stellar performance. Although cheap in price, these headphones deliver you very clear and crisp audio sound without the hassle of wires. The comfortable headband of the headphones makes their usage highly convenient. The headphones deliver a smooth and intrusion free reception up to 150 feet through RF signals. Just like the RS120 above, this model also has the capability to penetrate the signals through the walls. So, you can easily move from one room to another without any loss of signals or audio. The battery life of the headphones is highly impressive as it can deliver up to 25 hours of operation. The setup of the headphones is also pretty simple and easy and about anyone can do that. The frequency response of the headphones ranges between 10 Hz and 22 kHz. And the sensitivity of the headphones is 100 dB. You can easily switch them on or off through the power button located on the earpiece. The headphones boast a beautiful design in a black color that gives them an elegant look. In addition, the weight of the headphones is also pretty less, making their user-friendliness even higher. The complete package contains the wireless headphones and rechargeable Li-ion battery. The headphones also offer a limited warranty of 1 year period. For those of you looking for a more versatile and premium option, the Avantree wireless headphones are definitely going to grab your attention. Unlike many other wireless headphones, the Avantree uses Bluetooth technology instead of RF. However, if your TV doesn’t support Bluetooth, you also have the option to separately get a transmitter for watching TV. These amazing headphones are not just great for TV but you can also enhance your gaming experience with them. The recommended low-latency supported Bluetooth transmitters to be used with these headphones include Saturn Pro and Avantree Priva II. The headphones deliver excellent and fast audio with a minimal delay of 32-40ms. The sound quality of the headphones is remarkable. You can enjoy all kinds of music with these headphones and they are sure to make it sound way better. The headphones deliver accurate and precise audio throughout all the frequencies, making them ideal for many other kinds of audio experiences like Xbox, PS, PC gaming or anything else. These premium quality headphones have a huge battery life that can run up to 40 hours. The best part about them is that they also include a 3.5mm cable, so you can convert them into wired headphones if you want to save up on the battery. Comfort level is extremely high in these headphones because of their lightweight and user-friendly design. The adjustable headband and the padded earpieces make them perfect to be used for long hours. Another eye-grabbing feature of these headphones is that they also come with a built-in microphone. The built-in, one tap connect NFC is also there to let you easily connect two phones with it at the same time. And above everything else, the headset comes with a 2 years warranty, making it totally worth the price and hype. Our next choice for the best wireless headphones for TV is the RIF6. These are again a quite pocket-friendly option with tons and tons of benefits, making them too good for their price. If you want to enjoy a greater audio quality with superb clarity and crispness then you must choose RIF6 without looking for anything else. The headphones provide a dynamic sound range throughout all the frequencies. This means that you can enjoy music too well with these little sound machines. The signal coverage of the headphones is very impressive and strong. You get completely intrusion free signals all through its range of 100 feet. These versatile headphones can be used with your PC, Radio, Smartphone, iPod, and TV all alike. These headphones make use of the digital UHF 2.4GHz RF, which allows the signals to breach through the walls to reach you without any sort of interference. The RIF6 boasts a set of multiple smart features that include a mute option, speed charging option, volume memory preset, power alert, and LED power indicator. Like all other options in our list, the RIF6 also features a very lightweight and comfy design. The adaptable headband with soft pads all over makes you feel like you are wearing a little air filled pillow on your head. You can easily keep wearing them for hours without even feeling they are there. The model uses rechargeable NI-MH batteries that are included in the package. Charging these headphones is like a piece of cake. All you have to do is to place them on their base station and they automatically start getting recharged. Once fully charged, the battery life of the headphones is up to 20 long hours. CRYSTAL CLEAR SOUND - Enjoy amazing digital dynamic sound range with a Frequency Response of 30HZ - 20kHZ, and low THD+N with a Signal to Noise Ratio far greater than traditional analog systems. 100 FEET OF RANGE - Listen to your TV, Computer, or Hi-Fi radio from your backyard. Unlike others, these TV headphones use a digital UHF 2.4GHz radio frequency that penetrates walls, so your signals have an expanded reception range (up to 100ft) that don't require keeping the headphones within line of sight of the transmitter. LIGHTWEIGHT AND COMFORTABLE - Adjustable soft padded headband and Over-Ear earpads are designed to provide maximum comfort. Listen to music for hours and forget you're even wearing them! 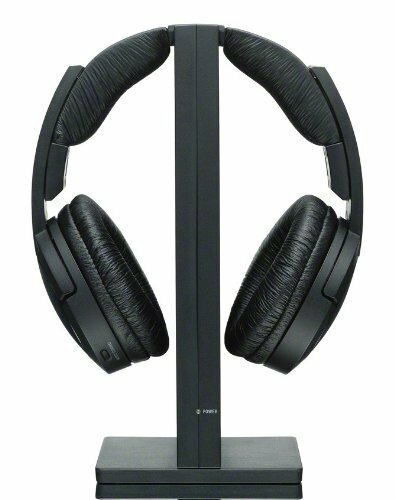 RECHARGEABLE BATTERIES (INCLUDED) - The supplied rechargeable NI-MH batteries last approximately 20 hours on a full charge - and recharge automatically when you place the headphones on the base station. ON EAR CONTROLS AND SMART FEATURES - Volume memory preset, ON/OFF LED Indicator, Muting, Speed Charge and Low Power Indicator Alert, Supports TV, MP3, iPods and Smartphone Devices. - 1 year warranty - more details in the product description. 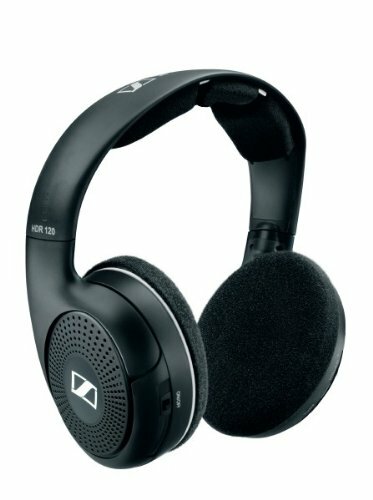 The last one is again from Sennheiser but is a much more advanced and premium level model from the company. The Sennheiser RS195 comes totally packed with features that will take care of all of your audio requirements. These enthusiast level headphones are ideal to be used for listening music, watching TV, and watching movies even. These high-quality headphones deliver an excellent wireless aural broadcast with a maximum range up to 100 meters or 328 feet. This means that these headphones boast the widest signal range in comparison to any other one on our list. For high clarity and precise audio sounds, the headphones feature selectable hearing boost presets along with a separate noise suppression mode. The headphones offer a special music listening mode that works amazingly well across a wide frequency range for providing you excellent control over all the bass and treble. The ergonomic design of these headphones with modifiable size and cushioned surface make their usage more pleasurable and fun. They are so comfortable that you can even forget that you had put them on. These headphones come with multiple automatic and manual controls that are present on both the headset and the transmitter. This model, being highly versatile, is compatible with devices having both analog and digital audio outputs. The usually annoying charging part is not as annoying with these headphones because they feature an easy-charge option. You just have to put them on the charging cradle and voila! Although these headphones are too great, they are not compatible with the Bluetooth technology, which is something we would expect from these being advanced level headphones. Other than that, they are pretty cool and all in all a great option. The two-year warranty that comes with them adds up to their awesomeness. Selectable hearing boost presets with an additional noise suppression mode for clearer dialogues and superior speech intelligibility. Music listening mode for increased dynamic range. Two year warranty when purchased from an authorized Sennheiser dealer. 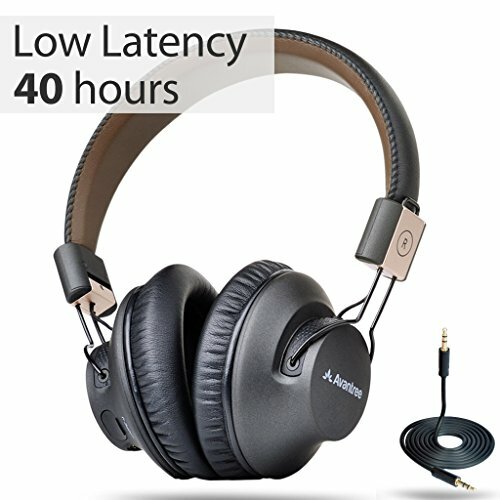 Wireless headphones, as their name suggests are headphones that do not use any wire. The wireless headphones give you the liberty to move around freely while watching TV without making yours or anyone else’s life miserable with any cables lying around. Wireless headphones are especially useful if you live in a house with children. Because it is a common occurrence to see children tripping over them, breaking both their teeth and the headphone jacks. To avoid such incidents, wireless headphones came into being and are now considered the most convenient option for listening audio. Just like any other wireless device, these headphones use audio signals that are transferred via RF. The base unit is plugged into your TV and then it sends the audio signals to the headset through the transmitter. Apart from RF signals, some models also use Bluetooth technology, which is known to provide abetter sound range. However, the headphones with Bluetooth technology do not offer a wider bandwidth, making their sound quality not so impressive for people whose first priority is high-resolution sound. The wireless TV headphones have gained a significant popularity over time because of their versatility. And you can use them for various other purposes, especially if you go for the renowned brands. The setup and connection procedure is easier than you think. All of these headphones come with two parts. First one is the base unit and the other one is the headset itself. The base unit is the one that is attached to your TV and it also serves as the charger for your headset. And once you have connected it, the base unit transmits the audio signals to the headset through the wireless transmitter. The connection port is given at the rear side of the TV. All you have to do is to connect the audio cable to the right port. The standard size of these cables and most of the audio unit or optical ports is 3.5mm. Once connected, your base unit receives the audio from your TV through that port. And then the base unit transmits those audio signals via RF or Bluetooth to the connected headset. 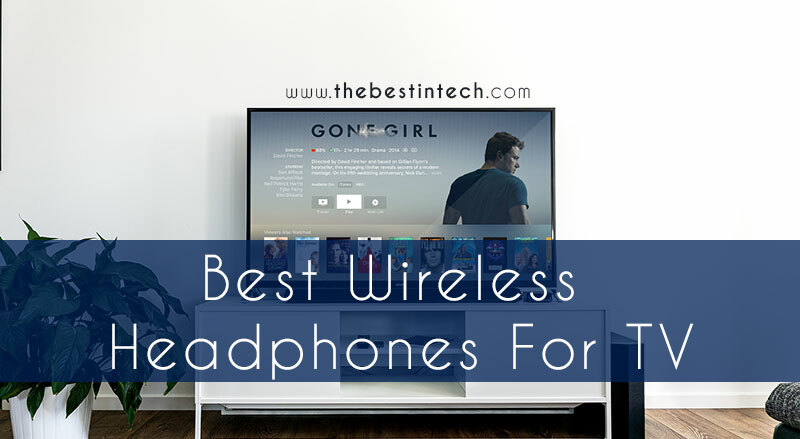 Nowadays, the majority of the televisions are coming with built-in Bluetooth or wireless technology that lets you directly connect your headset to the TV without the need of base unit. But, if your TV is not advanced enough, you always have these dual unit wireless headphones. Wireless headphones make your life easier by giving you the freedom to watch TV anytime without waking up the neighbors or people within your own house. As you saw above, there are several options available in the market and all of them carry some specific specialties. In our list, we have tried to cover the ones that can easily fall under everybody’s budget and offer an overall superior performance. We are certain that after going through all the above-mentioned information you’ll have made up your mind by now. But, if you are still confused about your selection, just choose one from the list as per your budget. And we are 100% sure that you will love it.